In the 1920s and 1930s two ladies were known as the Angels of the Desert because of their deliveries of medicine and food to those living on the desert of Sunnyslope who were ill from TB or asthma. Elizabeth Beatty, a retired secretary, arrived in Sunnyslope in 1918. She became very interested in the few families which were living on the desert north of the Arizona Canal. In 1924 she contacted the Washington School District to get books for the few children in Sunnyslope. The school was apprehensive but finally did give some text books which were being discarded or were torn or tattered. Out of fear of the TB germs, a spokesperson for the school, told Miss Beatty not to return the books but to burn them when they were no longer needed. Children were always Beatty’s concern. She wanted them to have books as well as food. She visited the homes to make sure the children had enough food to eat. Beatty owned a home just south of the canal and west of Central. She had inherited it in the early 1920s, following the death of her sister-in-law. She gave the house to the Desert Mission after it was established in 1927 and it became the manse in which the directors of the Mission could live. Beatty then moved to Beatty Court, a group of small cabins located north of the Arizona Canal, at Central and Ruth. It was also a property which she had inherited. Beatty continued serving the needy of the community until poor health forced her to retire. She passed away at the Desert Mission Convalescent Hospital (a forerunner of John C. Lincoln Hospital) in 1955 at the age of 86. The photograph above left shows Elizabeth on the left with Helen C. Lincoln and John C. Lincoln. W. A. and Marguerite Colley and their asthmatic son came to the desert of Sunnyslope in 1919. They were the second permanent residents here. They purchased five acres for $100 per acre near 3rd Street and Townley. Marguerite was a practical nurse and a social worker. She soon began visiting her sick neighbors bringing food and aide to their bedsides. She met Elizabeth Beatty who was also providing help for those suffering from TB or asthma and they worked with Maricopa County Health Department, which provided medicine for the ill. They continued delivering food baskets with the help from the Desert Mission. In 1931 Marguerite was hired by the Northside Welfare Association to continue working with those who needed help. 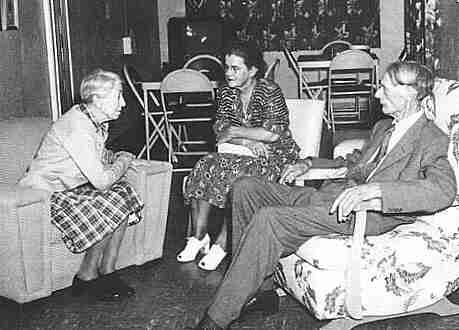 In 1935 she joined the Desert Mission staff as a social worker. She later worked in general supply at John C. Lincoln Hospital. She died in the hospital in 1973 at the age of 84. 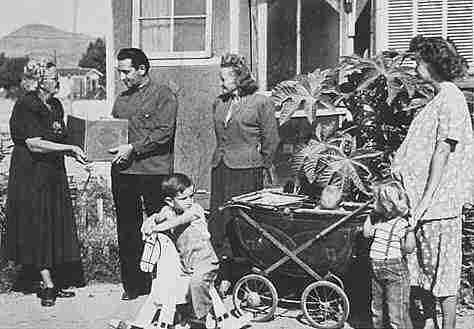 The photograph on the left shows Marguerite delivering a food box to a Sunnyslope family.